Hmm, looking at it now, is misplaced. 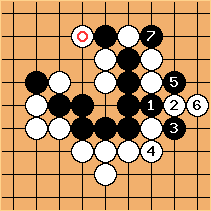 White at a seems to kill. Difficult problem! plays on the point of symmetry. 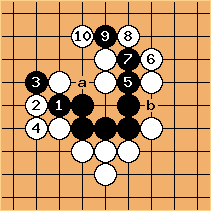 or a, taking away a liberty, is the best response I can find - the sequence from can be played on whichever side white does not respond. 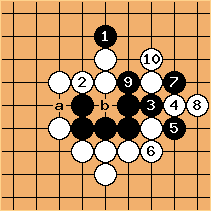 Playing at first allows black to avoid pushing out on both sides, which loses liberties. Alex: This is what I was going to say, and I think it's correct. 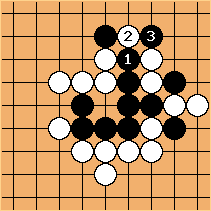 Few people would find this sort of tesuji in an actual game, but it's kind of obvious as a problem, since you know that a) it wouldn't be much of a problem if simply pushing out would work, b) it's a problem, so there must be a solution, and c) there really isn't anything else to consider. Unless someone can refute this, I think it can be moved to the solutions page.